Wow! I am excited to report that I completed this challenge! And it was a challenge. I’ve had a lot of hits on my blog from people searching for information on this challenge, so I decided to answer questions that showed up in Google Search Terms on my stats report. My answers relate to what I did and my experience with the challenge. If you want to see how I really did you will have to read the questions and the answers to find out! 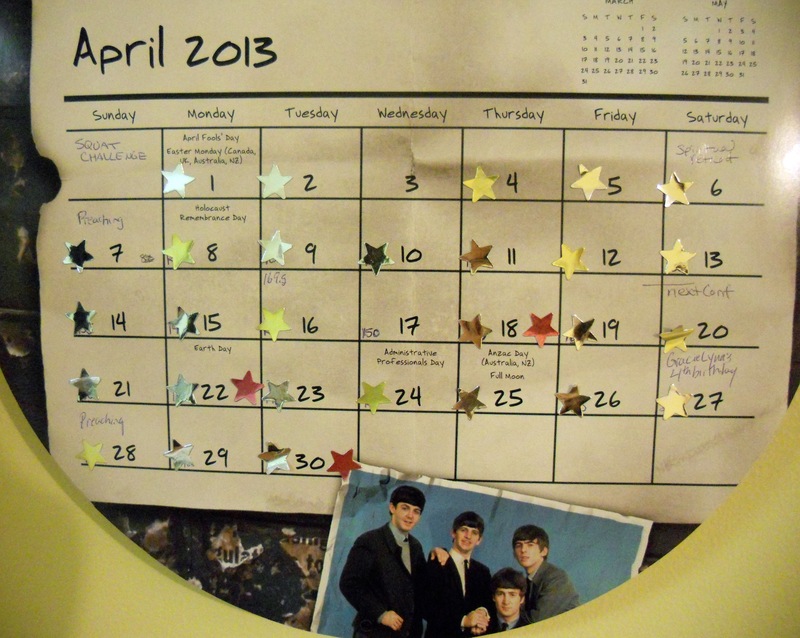 But first, look at my calendar filled with stars! I only missed 2 days. A couple days have an extra red star. Those are days that I did other exercise besides squats. I really only focused on squats and no other exercise. I just needed to see if I could do the challenge for myself. And yes, yes I did! Do I have to do the squats all at once or can I do them in sets? This was the most popular question. It came written in different forms, but this was what people were looking for the most. I would say YES, you can do them all at once or in sets. For me, I did them in sets and depending on the amount for the day I broke it up into 2 – 5 sets. For example, for the last day you do 250 squats. I did 5 sets of 50. My sets never went higher than 65 squats at once. My friend, Anna, is doing this challenge and she just completed day 10 and did all 105 squats at once! Way to go! That is so awesome. Check out her blog at MommaG. She is an inspiration for me as she posts daily what she is up to for exercise. Push yourself and do what your body can handle. Especially do them in sets if you have slight knee issues. Where did the 30 Day Shred Challenge Come from/ Start? Good question. I have no idea. Probably someone who thought I want to challenge myself to do 250 squats in 30 days. They made out a schedule, posted it somewhere on the internet and it went viral. That’s what I think. Who has done/finished the 30 Day Squat Challenge? ME! My friend Anna is doing it now. According to the internet, there are a lot of people out there doing this challenge. Seems like 30 or 31 day challenges are the next best thing right now. When do you see a change during the 30 Day Squat Challenge? For me, I did not see great change. Probably if I was doing other exercise with the squats then I might have saw a greater change. I have lost about 1/2 ” on my lower thighs and can tell that around my knees and hamstrings that I am a bit more toned. For me the most important thing was that I actually did the challenge and finished it! That’s a win in my books. It makes me feel like I can conquer other challenges I put before me. Like my new Early to Bed, Early to Rise challenge. What if you miss a couple of days of the 30 Day Challenge? No biggie. Just continue on. If you want you can make up for it on a rest day, but if not just keep calm and carry on. I wouldn’t worry about it too much. If you really want you can extend your challenge to make up for those couple of days. Now if by a couple days you mean a week, well that is a little different. How do you do the 30 Day Squat Challenge Properly? Please see my first post on how to do a proper squat. If you are not sure, use a chair to get you started. Be sure the weight is going in your heals and stick out your bum. What exercise should I do after and how many squats should I do after the challenge? This question is a combination of a couple questions on the list. For me, I would like to do at least 50 squats a day just to keep it up. As far as what exercise to do next? Choose whatever you want. I’m choosing to walk more. Maybe try an Ab exercise challenge. This was a leg challenge, so an upper body challenge might be good. You know, cause I’m an expert at this stuff! Why does the 30 Day Squat Challenge have a break? Perhaps to give your lower body a break. I hear often that you should rotate the type of exercise you do between lower and upper body and so on. I appreciate the break. It is always good to give your body a rest. The important thing is not to stay on the rest and not continue with exercising. That’s my problem. I go in spurts so this is why it was so important that I finish this challenge. It was a jump start back into good exercise rhythm for me. Should I warm up before I do the squats? Once I went for a short walk and then did my squats after. That made them easier to do. You could stretch before hand. I did not. But I always stretched after I did the squats. What is the impact of the 30 Day Squat Challenge on my knees? If you have bad knees, this is probably not the challenge for you. It requires bending the knees and can be painful for some. You don’t want to put out your knees because of this. I have funny knees that crack when I do my squats. Another reason I did my squats in sets instead of all at once. I actually have exercises that I am suppose to do to build up the muscle in my knees. So should I have really done this challenge, maybe not, but my knees aren’t so bad that I couldn’t, so I did it anyway. I did my knee exercises when I thought about it. That probably would have helped. If you have great knees then you shouldn’t have any problems. As long as you are doing the squat properly it should not cause new problems. I think that is all the questions. I did combine questions and wrote them in my own words. There was some broken English in there and not many people write full sentences when doing a Google search. If I see other questions roll in I’ll add them to this post. Thanks for reading! Get out there and get fit! If you have better answers to any of these questions, feel free to respond in a comment below! Want something more then the 30 Day Squat Challenge? Check out my series on the 21 Day Fix. Do you do different types of squats? Or continue to do the same? I did the same type of squat… the “normal” squat. I’m sure you could switch it up though. Or add lifting weights with your squat – example do arm curls while you squat. Adds a bit of a challenge and works your arms too. How is it going? You are just past day 15 now. I did notice a slight change by day 15 in my booty and by the end of the challenge a little bit more. But not a significant change. I think it depends on how deep you go into the squat. Also, what other exercise you are doing and healthy eating. It all factors together. Good luck and keep it up!